The first President to publicly utter the idea of a "New World Order" and original member of the CIA, many Americans believe this man to be the epitome of evil. Many Americans are now reacting by saying current President Donald J. Trump can now declassify the material on the assassination of President John F. Kennedy; material that was withheld from public release despite being old enough to be declassified. It is thought by many Americans that Bush, who ran the Office of Special Services (OSS) at the time of Kennedy's murder, which later became the CIA, played a direct part in the Assassination of Kennedy and the ensuing cover-up; all under the direction of Bush. Decades later, John Kennedy, Jr. son of the late President, who was affectionately called "John-John" launched a Magazine and publicly said "the name of the man that killed my father is the name on the magazine that I run." Name of magazine was GEORGE. When he presented his magazine, “George,” to the world, he was, for all practical purposes, signing his own death warrant. “George” was a veiled threat…in a symbolic sort of way. How many men named “George” come to mind at just the thought of President John F. Kennedy’s so called assassination? The cabal wanted his father dead, that is a fact, but the namesake of John F. Kennedy, Jr.’s magazine -- their minion -- arranged it. And…once John-John had the proof, the truth would come out in his very own magazine. Do you see? Many researchers and historians have come to the conclusion that it was the elite power structure running the US Government from behind the scenes that were responsible for the assassination of JFK, and that there was more than one reason for them doing so. There are photographs claiming to show that George Bush was at Dealey Plaza in Dallas on the day of the killing, and while they might be inconclusive there are multiple other sources that George Bush was one of those responsible for the assassination of JFK and that he was indeed there that day. "They'll build a memorial for him at Bohemian Grove right next to Moloch"
a reference to the secret society Skull 'n Bones which allegedly meets at Bohemian Grove to worship satan and plan world chaos to enrich themselves. Others pointed to the Iraq War in 1991 and recalled that it was George HW Bush that initially gave Iraqi leader Saddam Hussein tacit approval to invade Kuwait and once that took place, it was Bush who stabbed Hussein in the back by declaring "this aggression will not stand" and taking America to war against Iraq; setting in-motion a series of world events we still suffer to this day. The Bush family has been associated with Nazis, Planned Parenthood, the King of Saudi Arabia, the Bin Ladens, the New World Order and 911. George H.W. Bush was a former CIA operative and director of the CIA. Stefan Halper, just recently involved with Carter Page, the FBI, etc. as an “informant” against then-incoming President Trump, is a long time Bush operative going back to the 1980s, maybe the 70s. He also had ties to the CIA. Former Presidents Barack Obama and George H.W. Bush spent time together Tuesday in Houston, according to Bush 41's spokesman. On Twitter, Jim McGrath wrote: "President @GeorgeHWBush was very pleased to receive President @BarackObama this afternoon during his visit to #Houston. The two had a very pleasant and private visit at the Bush residence, where they rekindled what was already a very warm friendship." President Obama was in Houston to attend Rice University's Baker Institute for Public Policy gala. 3 Days later, Bush is dead. Said one American about the Obama visit to Bush "its appropriate that Lucifer pays him a visit before his passing" while another American described Obama as "the black angel of death." It won't be long until the deep state and the liars and hooligans of politics all line up to claim Bush to be a thousand points of light; call him a hero and laud him. It will mostly be an act of deception because it was Bush who once said "If the American people ever found out what we've done, they chase down the street and hang us." As you watch the funeral-related events in coming days, you may notice that the Liberals LOVED this guy . . . and that's all you need to know about what kind of person he truly was. 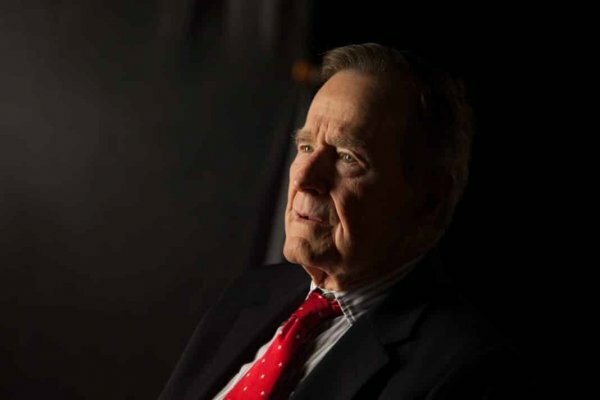 For many Americans, the fire pits of Hell can't possibly be hot enough to repay George HW Bush for his evils. Thankfully, he started paying for those evils just after he took his last breath.